A dynamic processor is something that outputs a signal, where the level of the outgoing signal is based on the level of the incoming signal. In other words, a loud signal coming in will come out differently than a quiet signal coming in. The most common. The louder a signal is coming in, the less level it provides going out. In a compressor, a target level is set — called the “threshold” — and any signal coming in that exceeds that level will be reduced. The higher the level above that threshold, the more reduction will occur. More on this later. Limiters are like super compressors. The idea is to ensure that the level does not exceed the threshold. Because this amount of compression is extreme, a limiter relies on certain functions and design that regular compressors do not have. The quieter the signal is coming in, the less level it provides going out. In other words — it makes quiet signals even quieter. Much like a compressor, the threshold is set at a certain level. Any signal that does NOT exceed that threshold is reduced, and the quieter the signal, the more reduction is done. Gates are like super expanders. Anything that does not exceed the threshold is reduced to inaudible. Again, because gates are extreme, they often require a slightly different design than a regular expander. I’ll focus primarily on compression, because that’s going to be the most commonly used dynamics processor. Every signal you hear is compressed? Yes, every signal you hear is compressed. Bear with me. Imagine you have a rapper in front of a microphone. The rapper raps and you record. You play it back. You haven’t used any processing and you’re just playing back the raw vocals. You are listening to a signal that has gone through at minimum, three stages of compression, and more likely, closer to six. The microphone capsule gains tension as the rappers voice pushes it — in other words — it pushes back. The more the rapper’s voice pushes in, the harder the capsule diaphragm pushes back. In other words, the louder the signal hits the capsule, the more reduction the capsule does to the signal. That’s compression! (It’s mild compression, but it’s still compression). Along the way through the microphone, you may hit a tube. Tubes have a non-linear response to voltage. The response is quite curved, and also changes the frequency balance of the signal. This is called saturation — which will tend to “round out” a signal by reducing the loudest peaks. Compression! And before leaving the microphone, the signal may hit a transformer too, which will saturate in a similar way… more compression. The preamp is going to have multiple stages of saturation, and often times, the more gain you give something, the deeper the saturation curve. In other words, the more you drive a signal at the preamp, the more compression the signal experiences. So this is a bit of a simplification, but there’s a point here. The point is that “compression” is always part of the signal. Some mics have less of it, some have more — same with speakers, tubes, transformers, etc., and they all do it in different ways. With tubes, people will talk about their saturation curves and %THD (total harmonic distortion — or frequency alterations). With mics, people will refer to how it “grabs” a sound — or more specifically — the sound’s shape. Instead of thinking of a compressor as compressing, think of it as something changing the shape of a sound. If you start listening for “shape,” the mysteries of compression will reveal themselves to you fairly quickly. It may help to think of shape in terms of a sound’s envelope: attack, decay, sustain and release. A transient is a very fast signal — in other words the “attack” of the signal. Drums have transient attacks. Strings have gradually rising attacks. So the attack control on a compressor is really like asking how much emphasis on the attack of a signal you want. Do you want the attack to be really rounded out and diminished? Set the attack fast. Do you want the attack to be prominent and stick out? Set the attack slower. Of course, this works directly in conjunction with the threshold. There is a thin line between a transient sound, and a sustained sound. A sound that holds for any noticeable amount of time is sustaining. A sound that moves by too quickly to register as it’s own moment is transient. But transients can vary in length. A transient can be half a millisecond or it could also be ten milliseconds; they won’t sound the same. A big factor in punch is how long that transient exists. A quick transient sounds “spikey,” but a long transient sounds “punchy.” You want to find the point that makes the transient exist as long as possible before “flattening out” or becoming a sustained sound. Only your ear can tell you where that point is. Good samples are already shaped to have that kind of impact — and any additional compression may actually soften that. Of course, punch has a lot to do with frequency as well, but that’s for another article. Now what about the release? The release is super elusive. It determines how long it takes for the compressor to let go. If the release is too short for the signal, you are going to get a disjointed sounding shape which usually results in distortion. If it’s too long, your signal never really returns to its natural shape, and you generally lose tone (or you just get permanent drive on the compressor’s output, giving the whole signal a new bit of tone). So the idea is to find a point that emphasizes the sustain properly (which is where most of the signals tone lives). Lastly, when the attack and release are set in a way that seems to argue — the compression can become very audible. You either hear the descent or ascent of the signal level. This is called pumping. It’s generally annoying, but can sometimes be used as an effect. If audibly desired, consider the rhythm of the release time, and ask yourself if it’s groove is complimenting the song. Rather than thinking of a compressor as something that effects the “level” of a signal, think of a compressor as something that effects shape. Why? Because level can be controlled with the volume fader more accurately and transparently. A fader doesn’t really control shape, unless you are being extremely meticulous. Conversely, compression will always effect the shape of the sound it is working on. 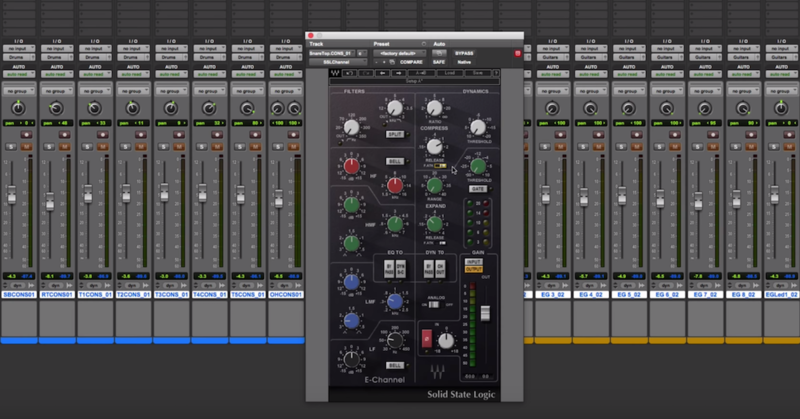 Matthew Weiss takes the mystery out of compression in Mixing with Compression. He teaches you what it is, what it sounds like and how you can use compression to take your mixes to the next level. Check out the video to learn more.